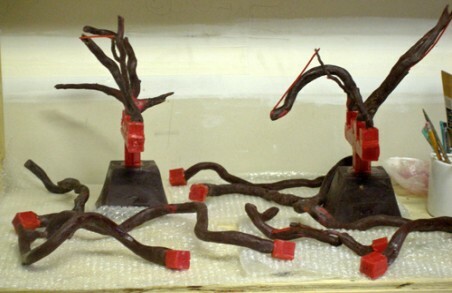 The lost-wax process for casting bronze hasn't changed much since the Renaissance. There have been technological advances in materials engineering, which allow for more efficient production and more consistent quality, but we still employ similar techniques to the ones our ancestors used during the Bronze Age. The first step of the process is creating the original, called the pattern. The pattern is usually created in oil-based or water-based clay, but it can also be created in other media (such as embedded wood, bones, and other elements). The original is a positive while the molds are a negative. 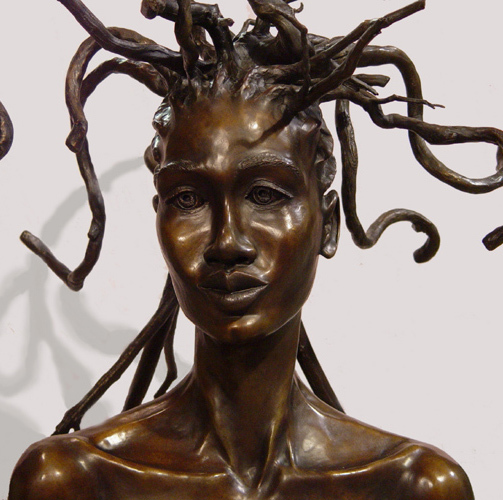 There are three positives made during the process, the original, the wax, and the bronze. 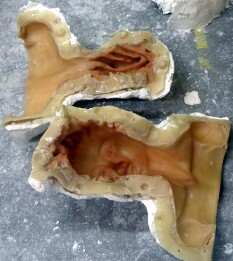 There are also two negatives, the mold for casting wax and the mold for pouring the bronze. The pattern is a very creative part of the process. Usually the clay pattern is built over a sturdy armature, which keeps the clay from sagging or falling apart under its own weight. 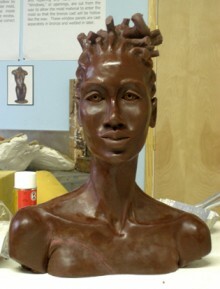 Once the artist is satisfied with the clay, it is ready to be molded. 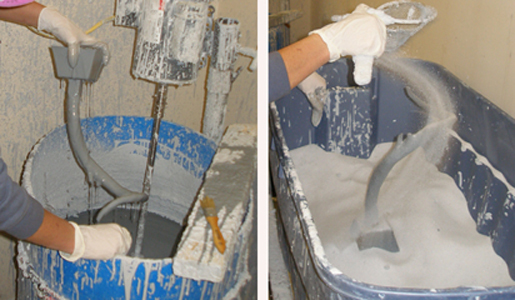 The clay is prepared for molding by applying a silicone based liquid spray that acts as a release agent. This agent keeps the mold from sticking to the pattern when removing. Next, a urethane or silicone rubber mold is applied to the pattern one coat at a time. The first two coats are very thin to capture details of the pattern and to ensure that no bubbles or air pockets form on the surface. Shims of plastic that have spherical buttons are inserted along the seam line after the first two coats of the mold. The buttons ensure that the mold fits back together correctly after it has been taken apart. After the pattern is completely incased in rubber, a shell is constructed called the ‘mother mold’, which is made from moulding plaster reinforced with hemp fiber. The mother mold will keep the rubber, which is malleable, in the correct shape once the pattern is removed. Microcrystalline wax, a petroleum-based wax, is melted and poured into the rubber mold. It is sloshed around ensuring that the entire inside surface of the rubber is coated capturing all detail. The excess is poured out. This is repeated until the desired thickness is achieved (usually 1/8" to 1/4"). This creates a hollow casting, so the bronze will be hollow as well. 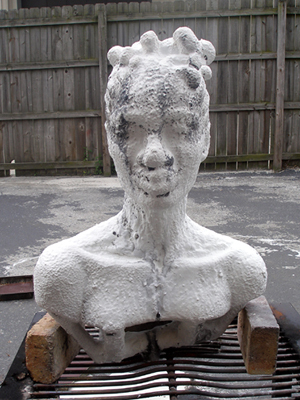 A hollow casting is required to mitigate excess weight and to avoid shrinkage as the bronze cools, causing flaws in the surface. After the wax cools, it is gently removed from the mold. The wax is then 'chased' to clean up seam lines from the mold and any flaws in the wax, such as air bubbles or other surface imperfections. This is accomplished with soldering irons and small wood and metal tools. 'Sprues', or wax rods, are attached to provide channels for the metal to flow through and reach the pattern. They also provide a way for gas to escape as the pattern fills. The sprues that feed the pattern with the metal are called 'gates', and the ones that allow gas to escape are called 'vents'. Sprues are welded to the wax pattern using a soldering iron and sticky wax. Next, the wax is covered in a ceramic shell mold, called 'investing'. It is dipped into a liquid ceramic slip made from colloidal silica and silica flour. This slip, called 'slurry', sticks to the wax while the remainder drains back into the mixing tank. Silica sand, called 'stucco', is then poured over the surface sticking to the wet slurry. Fine stucco is used for the first few coats ensuring that the detail is captured. Coarser stucco is applied to the outer coats to add structure and strength to the mold. Each coat dries for several hours before the next one is applied. This process is repeated until the desired thickness of 1/4" - 1/2" is achieved and usually requires 6-8 coats for smaller molds and as many as 20 coats for large molds. Next, the ceramic shell molds (encasing the wax) are put in a kiln upside down. The kiln is quickly fired to about 1300° F, which melts the wax out leaving the molds hollow. It also vitrifies the ceramic material, heating the ceramic particles enough to melt and fuse together. This strengthens the mold so it will withstand the hydraulic pressure of the molten metal while being poured. After the molds cool, they are inspected carefully for any cracks that may have formed during the burnout process. Any cracks found are patched with a refractory mortar so the mold won't leak while it is receiving molten bronze. 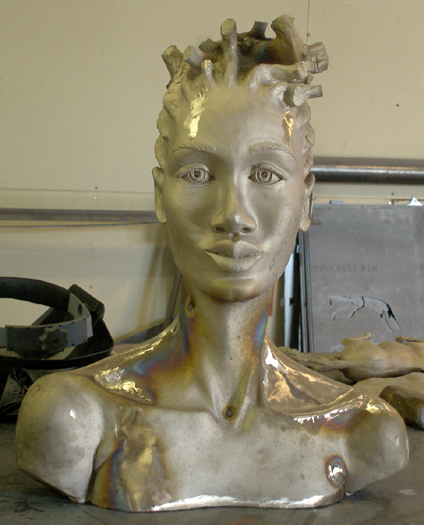 Now that the mold is empty (lost-wax method of bronze casting) and vitrified, molten metal can be poured into it. Bronze ingot is placed in a crucible made of silica carbide and put into the furnace. A gas/air mixture enters the open chamber of the furnace at an angle, where it combusts and creates a centrifugal flame around the outside of the crucible, heating it evenly. The bronze ingots take about 45 minutes to reach 2200°F, the temperature needed pour sufficiently. 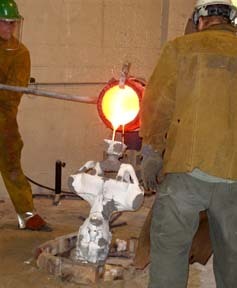 The crucible is lifted out of the furnace using steel lifting tongs and is placed into a set of pouring shanks. The molten metal is then poured into each mold, which has also been heated in a kiln to 1400-1500 degrees F.
After the metal has cooled, the ceramic mold material is gently chipped off using a hammer and chisel. The remaining mold material left in the crevices is sand-blasted. Next the sprues, which are cast in bronze along with the pattern, are cut off using an angle grinder and metal cutting disc. The stubs left behind are sanded off using various grinding and sanding tools. The cast parts are then checked to make sure they fit together properly. Necessary adjustments are made and then the parts are welded together. The welds are chased, also using various grinding and sanding tools. Surface textures are replicated with various tools so seam lines and sprue attachments are no longer visible. The sculpture is now complete other than color. The surface is sand-blasted, leaving it clean and consistent. A patina is applied using chemicals determined for the desired color. Patina is a controlled oxidation of the metal. Virtually any color can be obtained depending on the chemicals used, the application technique, and the temperature of the bronze when the chemical is applied. Often, patinas are applied in layers of different chemicals creating background colors and visual depth. Once the desired patina is achieved, the surface is heated with a torch and coated with carnauba wax. This gives the surface visual depth and shine as well as inhibiting further oxidation. 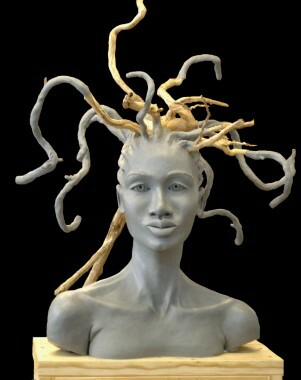 The sculpture is now finished and ready to be installed or mounted to a pedestal. 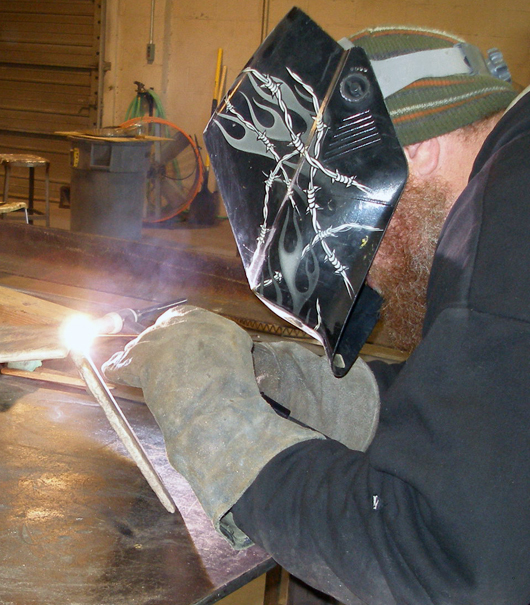 Metal Fabrication begins with an idea and a sketch. The idea evolves into a solid design as it addresses structural and aesthetic considerations. 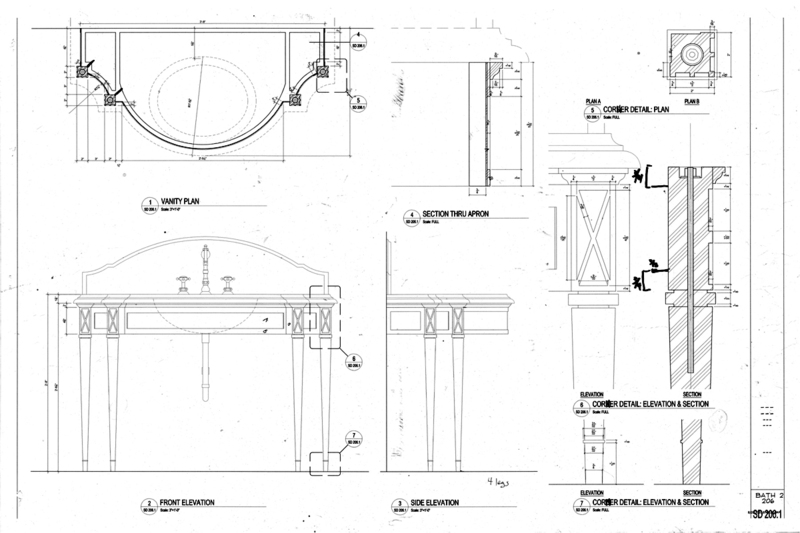 The design can be an architectural drawing, CAD drawing, or even pencil drawing that includes specifications. As is evidenced from the markings on the drawing, specifications sometimes change as the project evolves. 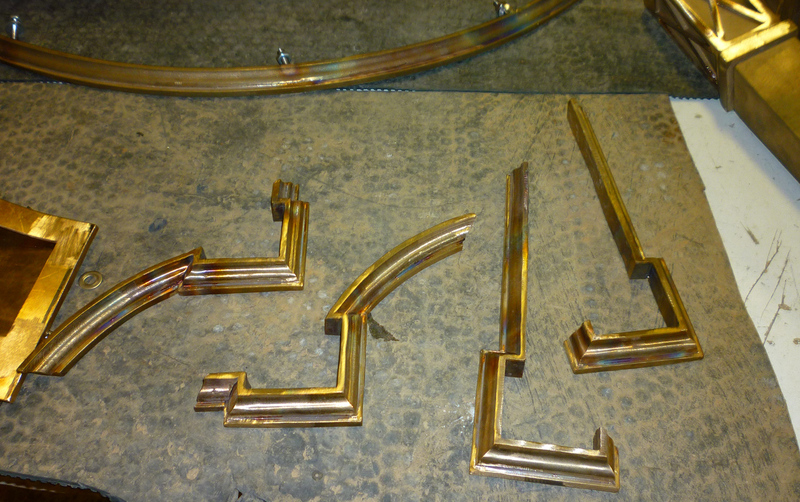 These bronze trim pieces were cast in large straight sections that were first cast in wax (please click here for Bronze Casting Process page). 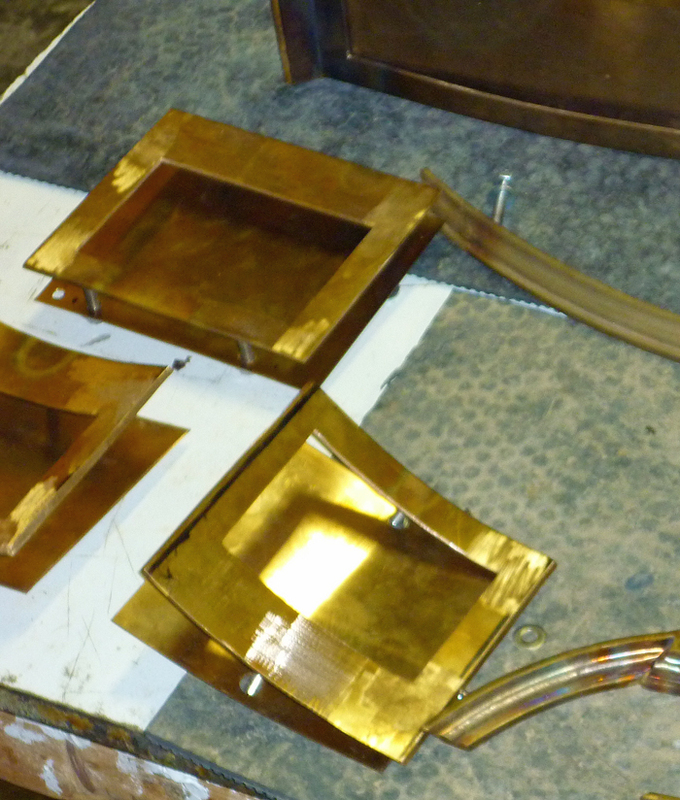 Once prepared in raw bronze, they were cut and welded to the exact specifications for the bronze vanity trim. In the TIG (tungsten inert gas) welding process, an essentially non-consumable tungsten electrode is used to provide an electric arc for welding. A sheath of inert gas surrounds the electrode, the arc, and the area to be welded. This gas shielding process prevents any oxidization of the weld and allows for the production of neat, clean welds. 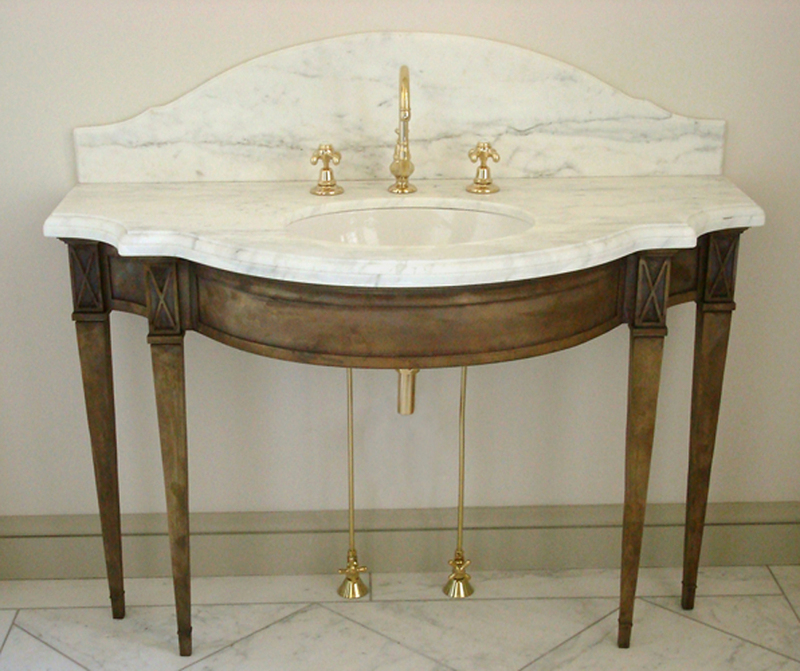 A wood frame was constructed for the vanity top. 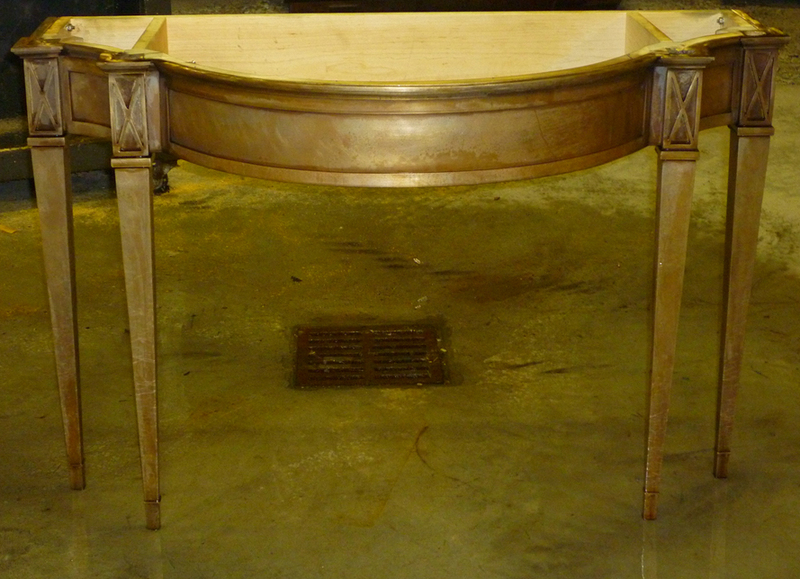 The fabricated bronze sections and cast bronze legs and trim pieces were attached to it. These are sections of cut and fabricated bronze plate that were carefully rolled to the precise radius for the concave elements. The larger convex elements are pictured in the previous photo. 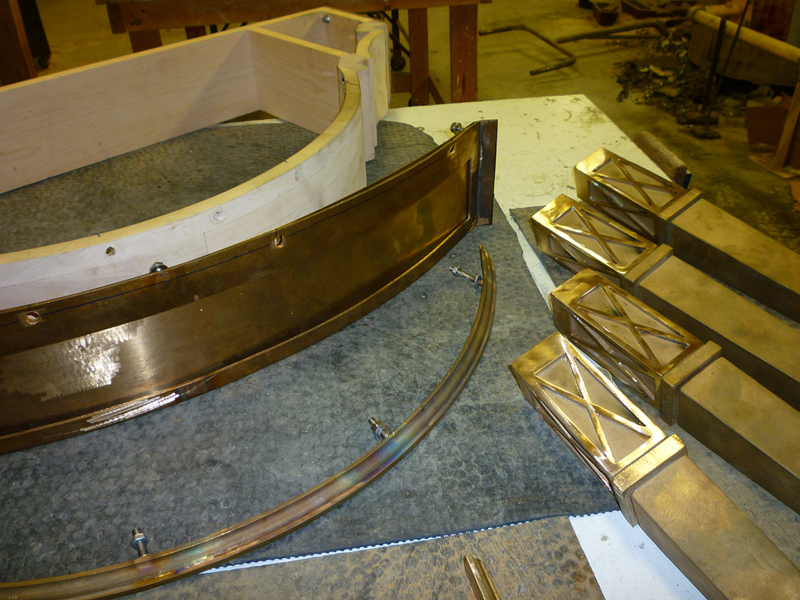 Fitting the cast and fabricated pieces of bronze properly to the frame is essential. Silicon bronze alloy is somewhat malleable and can be rolled and formed. However, some non-ferrous alloys can become work-hardened and must be annealed during the process of shaping to avoid cracks. In this case, we pre-sandblasted so we would not compromise the structure of the frame when we preapred the piece for a final patina. The final bronze vanity in our shop prior to installation.